Let me know your thoughts……no defect…..damage….or serious damage? I would score the florets based on the general defintion of damage. 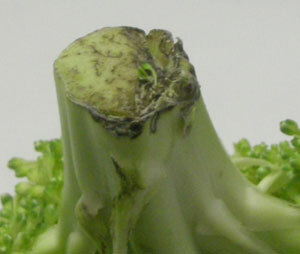 Florets are supposed to be ready to eat; the discoloration (whatever the cause) is objectionable. The majority of inspectors in our office agreed to score the discoloration as damage….no one would score it as serious damage. Is that you (PBB) Paul Bruce Beattie? 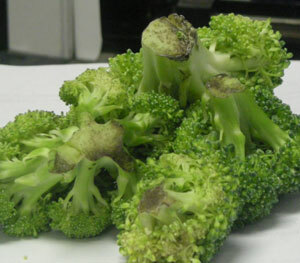 A comment from an e-mail I received- “I have also seen this web-like dis-coloration in broccoli- on my sample, after cutting, the discoloring went almost to the flower ends of the vegetable. It also left the vegetable with a bitter taste, and was extensively in-edible. I scored as damage but serious damage would also not be out of the question depending on the degree of the problem.